Better Cosplay Photos: Storing Your Photos | Cosplay Blog… with a Brain! Scott Kelby’s recent hard drive troubles got me thinking: How should you store your photos after you download them from your camera? 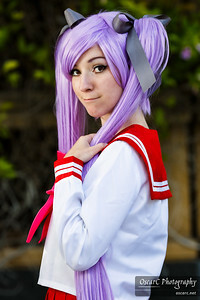 eclecticmaniac as Kagami from Lucky Star. The easiest approach is to store them on your local computer’s hard drive. You don’t need to buy or do anything special, and for some period of time it will work. Life is good… until it fills up. When that happens, you can buy an external (USB) drive, plug it in, and voila, more disk space for your photos! Even better, if you need to share your photos among several computers at home, many home routers have a disk sharing feature. Plug your USB drive into the router, and your files are available to everyone on your home network. Life is really good… until the hard drive dies. Hard drive failure is a “when”, not an “if”. Some drives fail in 6 months; some fail in 6 years, but eventually, all drives will fail. If your only copy of your photos was on the drive, say good-bye to your photos! If you don’t want to lose your photos and other personal data, you have to be ready for the day your drive dies. 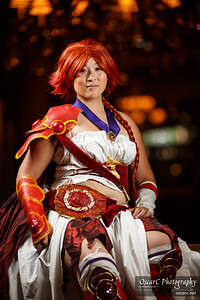 Blueskadoo as Hikaru from Magic Knight Rayearth. To do this, RAID is a technology that spreads data across multiple hard drives. The common types of RAID for home use are RAID 0, RAID 1, and RAID 5. RAID 1 is also known as mirroring. Given two hard drives, RAID 1 will write each file twice, once to each drive, causing the two drives to be exact copies (mirrors) of each other. If one drive were to fail, your data would be accessible from the other drive. RAID 5 is a way of spreading your data across three or more drives in a way that if one of the drives in the group were to fail, your data would be preserved on the remaining drives. However, if a second drive from the group were to fail before the first were replaced, your data would be lost. Many vendors offer multi-hard-disk appliances that support RAID 0/1/5, including Drobo, the brand that Scott was using. Using one of these units (in RAID 1 or RAID 5 mode) is very good protection against disk failures, and I strongly recommend it as compared to using just one drive or a RAID 0 set of drives. Now, life is really, really good. If a drive fails, you can replace it and not lose any data! What else could you want? Unfortunately, this by itself still suffers from three flaws. The obvious issue is that the appliance itself could fail. It is especially common for an appliance’s power supply to fail, and is what Scott ran into. If the appliance fails, your data is still intact, but it’s inaccessible until the unit is repaired. If you’re using a proprietary appliance like a Drobo, you’re going to be dependant on that company for repairs. If the warranty has expired, be prepared to spend a non-trivial amount. 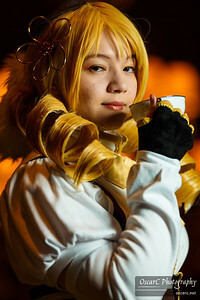 Rai as Mami Tomoe from Puella Magi Madoka Magica. The less obvious issue is that any disk appliance does exactly what the computer tells it to do. If the computer tells it to delete your photos, it will happily delete your photos from all of its drives. You could accidentally delete the wrong folder. A virus infecting your computer may deliberately destroy data. Someone you share your computer with may decide your photos are taking up too much space and delete them to make room for downloaded movies. Even less obvious is that all hard drives may become inaccessible at the same time. Your house floods or has a fire. Someone breaks in and steals the appliance. You leave the appliance running for long periods of time in a 120F room because you forgot to turn on the A/C before going on vacation. Cheshire as Doll from Kuroshitsuji (Black Butler). For all these reasons, you need to do backups of your photos, even if they are stored on an ultra-reliable, super-redundant, enterprise-grade disk appliance. There are two wrinkles to backups. First, if you’re like me and paranoid about the possibility of a failure during a backup, alternate between two external drives. That is, the first time you do a backup, back up to drive A. The second time, back up to drive B. The third time, back up to drive A again, and so on. OwlDepot as Juvia Lockser from Fairy Tail. Second, to make it less likely that you will lose data if something were to happen your house (burglary, fire, flood, etc), store one of those two external drives somewhere not at home. A friend’s house you visit often works well for this. Periodically pick up the drive, do a backup, and return the drive to your friend. This gives you something to fall back on in the event of a disaster at home. Finally, consider how often you should back up your data. To determine that, consider how much data you’re willing to lose, and balance that against how much time you’re willing to spend doing backups. For example, to ensure you lose no more than 2 weeks of data in the event of a failure, you will need to do backups at least every two weeks. Using a RAID drive for your photos and doing backups takes time and money, but it becomes well worth it the first time you encounter a drive failure and don’t lose all your photos as a result. This entry was posted in article, resources and tagged article, cameras, community, cosplay, photographer, photography, resources, storage. Bookmark the permalink.